Between Codlea and Feldioara lies Hălchiu – in the year 1377 the village was first mentioned in a royal privilege. It is one of the free villages that belonged to the judicial and administrative unit with Brașov. The so-called „Haldeboatschi”, which adorns the western portal of the church and goes back to the figure of Count Falkun, is regarded as the founder of the village. Still today it adorns the coat of arms of the village. A special feature is the altar of the fortified church: the choir of the Gothic hall church is rich in colour and unusually large, but its oldest structural elements date back to the 13th century. The double-winged altar is 8.1 m high and 7.7 m wide. The predella shows the visitor five figures, namely Abraham, Moses, Aaron, Peter and Paul. The figures trace the path to the divine redemption of mankind to the former parish priest Johannes Reichart. With the proclamation of the Gospel by Peter and Paul, this path is complete. Above the predella is the central shrine; the altar has two fixed wings and two movable wings painted on both sides, mainly in red, green and gold. 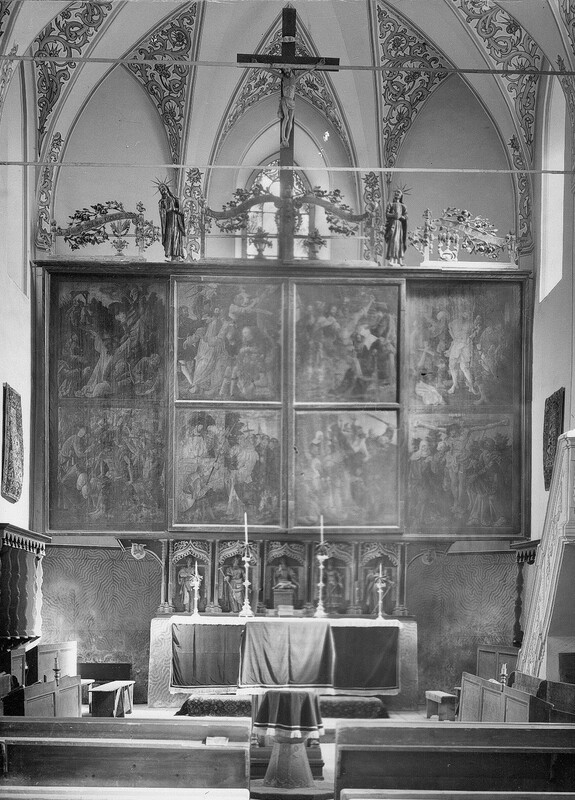 When the altar is open, four saints appear to the observer: each picture is also a story. The depictions with the saints show the martyrdom of the apostles Andrew and Peter and the execution of James. In a fourth picture, Saint Andrew saves a bishop from temptation by the devil. The middle of the holiday side of the altar is decorated with a Christ figure flanked on the left and right by the four evangelists. On the weekday page the Passion of Jesus is depicted: Prayer on the Mount of Olives, capture, interrogation, flagellation, crowning of thorns, Ecce homo, bearing of the cross and crucifixion. In the 70’s the altar was restored with help from the hometown community of Hălchiu. How old is the altar in Hălchiu? After our draw the winner will receive a church castle memory. Please send your submissions by 30 June to ab@kirchenburgen.org. Congratulations! Doru Radu answered correctly to our riddle. The altar of Hălchiu dates from the first half of the 16th century.